Here are this week’s five releases that I predict are going places. EA Mobile faithfully recreates this arcade classic on the iPhone. With the distinction of being one of the toughest arcade games to beat, I’m happy to say that this version of R-Type is as unforgiving as ever. EA hasn’t dumbed down the game to make it easy for today’s gotta have it now crowd. Blast off and strike the evil Bydo Empire! Pilot your futuristic fighter, the R-9a “Arrowhead,” and attack wave after wave of Bydo baddies in old-school side-shooter style. Fly through 8 levels, with a choice of two difficulty levels and 3 different control options – tilt, touch, and virtual D-Pad. Each control scheme has its pros and cons, but you should find one that will suit your play style. Upgrade with new weapons, power-ups, and attachments, which you’ll need to be triumphant in the game’s 8 epic boss-battles. 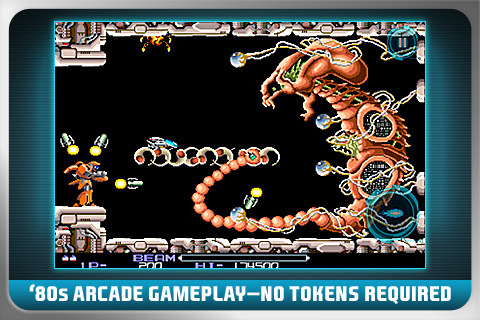 If you are looking for some challenging fun retro gaming, then R-Type is going to be touch to beat (literally). Another week, another amazing title from Chillingo, I think I’m starting to sound like a broken record. Anyone who got as addicted as I did to the (entirely too short) free game A Quest Of Knights Onrush, you’ll be ecstatic to know that it has been developed into a full and proper game called Knight’s Rush! This worth sequel to Knight’s Onrush. While Knights Onrush was a tower defense style game, and “Quest” was an endurance run Knight’s Rush is a full action platformer with eight worlds and over fifty different types of enemies and huge end-of world boss battles. The game’s 40 levels along with the charming cartoon graphics and sounds are sure to provide hours upon hours of entertainment. 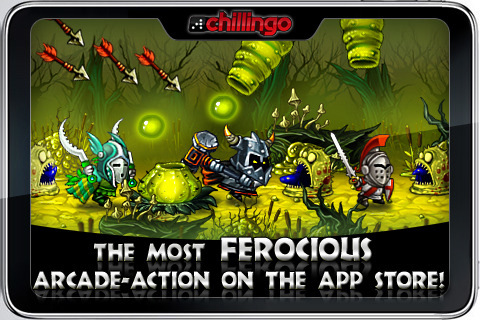 I have no doubt that Knight’s Rush will be another massively popular title for Chillingo. How’s this for a storyline…Mother Earth is on the brink of extinction and has released her last defense, the Great Death Worm, Wojira. Wojira is on a revenge mission to destroy all the Human parasites. Crawl and eat your way through waves of humans and their robots of destruction. You are the last line of defense, can you save the world? You are a giant worm wreaking havoc on humanity by eating whatever people or animals get in your way. The premise of Super Mega Worm alone has me hooked. Couple that with cool retro 16-bit styling and this one smells like a winner to me. I’ve had a chance to take this one for a spin and it is a some mindless fun! With the promise of new levels, more stuff to eat, more game modes, special powers, Game Center and iPad support on the way soon, Super Mega Worm’s $2.99 price tag is looking even more palatable. Dead Runner is a unique take on the endurance run genre, immersing you in the action with a first-person point of view. 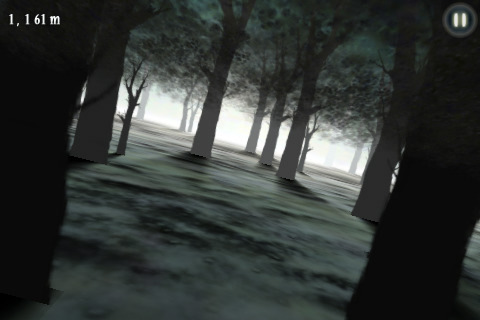 Both creepy, and exhilarating, this Blair Witch-like experience has you lost, running aimlessly through an eerie moonlit forest of dead trees. Is someone behind you? You’d better not stop and find out! The path ahead comes into focus just in time as you carve your way through the thick fog, trying to avoid crashing into the trees speeding by. This is a fun and different take on the genre, one which is sure to spawn its own set of copycats. I’ve already done a fairly extensive preview of Dead Runner, which you can read here. Needless to say, Dead Runner is definitely worth a look. 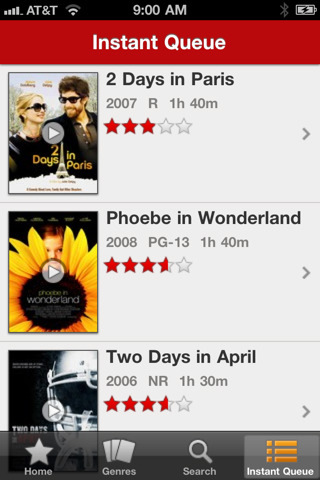 The Netflix app has now been updated to allow viewing on your iPhone and iPod Touch. Just download this free app and you can instantly watch TV shows & movies streaming from Netflix. If you have an unlimited Netflix membership, then you will be able to stream content directly to your phone via wifi or 3GS. You can queue items for instant viewing, your rental queue or even resume watching a show or movie where you left off on your TV or computer! In the brief tests I’ve done with this app so far, it look great over both wifi and 3GS. If you already have a Netflix subscription, then there is no excuse not to download the app. If you don’t have an account, maybe it’s time to get one, or at least a free trial.